Mental Health is still a taboo subject in the workplace. There are, thankfully, more and more articles being published about this subject and the press are also flagging it up at the moment. Unfortunately, it may take some considerable time before attitudes to mental health in the workplace will change. The stigma around being stressed, anxious, depressed, or having an even more severe mental health issues such as psychotic episodes, mental breakdowns and suicidal tendencies is still very strong. People are afraid to admit to having a problem as they may be looked upon as "less-than", unable to perfom their work adequately or unworthy of the position they hold and consequently may lose their job. They may be worried that a visit to the GP may encumber them with a mental health record that could affect their chances of finding a new job. Often the last person they will tell will be their boss. According to the Mental Health foudation "67% of employees feel scared, embarrassed or unable to talk about mental health concerns with their employer. To break this taboo and create an open and caring culture it’s important that those in higher positions get the board on their side and take a top down approach. If they are speaking out on the issue, perhaps even drawing on their own experience, then this attitude will trickle down to managers and then staff." MIND have some useful information and facts: 56 per cent of employers said they would like to do more to improve staff wellbeing but don't feel they have the right training or guidance. Boris Johnson, Mayor of London in his report last year on London Mental Health looked into how much poor mental health is costing our city. "I was shocked to see that it costs London’s businesses and industry a staggering £10.4 billion each year. Too often, a lack of support and understanding by employers means we do not recognise mental health difficulties in the workplace. This leads to a reduced pool of employees, more time off through sickness and lower productivity. "Over the past five years, the issue of workplace mental health has been continually rising up the agenda, not only for HR professionals and line managers, but for senior leadership within organisations. In workplaces across London, a quiet revolution is taking place around the water cooler as more and more people talk openly about mental health. We are now at a tipping point, with increasing acknowledgement from employers that more needs to be done to help people stay well at work, tackle the root causes of work-related ill health and to support staff who are experiencing a mental health problem. As this collection shows, a growing number of senior leaders now recognise that organisations are only as strong as their people – they depend on having a healthy and productive workforce and they know that when employees feel their work is meaningful and they are valued and supported, they tend to have higher wellbeing levels, be more committed to the organisation’s goals and perform better. Research shows that FTSE 100 companies that prioritise employee engagement and wellbeing outperform the rest of the FTSE 100 by an average of 10 per cent. 1. Good mental health underpins this. By fostering a mentally healthy workplace culture and putting in place the right support, businesses, small and large, find that they are able to achieve peak performance. The way we are all working is changing. In- demand skills such as teamwork, collaboration, joint problem solving, flexible working and staff development all require employees who are mentally healthy, resilient, motivated and focussed. As indicated in Deloitte’s 2014 Millennial Survey, Millennials (those born in the 1980s and 1990s) have shown very different preferences to their predecessors when it comes to workplace culture, wellbeing and self-development. Millennials prioritise a healthy work-life balance and a positive workplace, and are more likely to turn their back on the business that trained them if these needs are not met. 2. Managers need to be equipped to support staff to manage the increasing blurring between work and life. This is especially true for the London workforce. By fostering a mentally healthy workplace culture and putting in place the right support, businesses, small and large, find that they are able to achieve peak performance. Throughout the course of Mind’s awareness raising work on this issue, we have seen an evolution in how employers view workplace wellbeing, with the focus shifting from the reactive management of sickness absence to a more proactive effort around employee engagement and preventative initiatives. This shift towards an upstream approach has given employers the impetus to start looking at the mental health of their staff from a different perspective, and has led to a rapid increase in the number of employers commissioning our training. A good example of this momentum has been the success of the Time to Change Organisational Pledge. 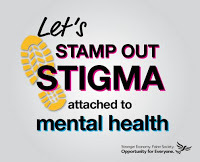 Time to Change, led by Mind and Rethink Mental Illness, is England’s biggest programme to challenge mental health stigma and discrimination. The pledge has offered organisations an opportunity to make a public statement of aspiration to tackle mental health stigma in their workplace, and develop an action plan detailing tangible activities to bring this about." If you are in a position to help change things in your workplace, then there is plenty of literature and support out there to help you. Every voice that speaks will add to positively affecting the change, and never thing you aren't making a difference. We all deserve to be treated as valuable human beings, and each of us will, at some point in or lives undergo stresses and diificulyt times. They should not be stigmatised. If you are suffering from mental health issues find someone you can trust to talk to or seek th esuuprt of a professional such as a counsellor, trusted doctor, or therapeutic coach.